The map below is a digital composite and overlay of a hand drawn map surveyed by Robert Erskine (Map No 87A) in 1779, made for General George Washington’s use to help evade British troop movements . Robert Erskine was the first Surveyor-General of the United States, having been appointed Geographer to the Army by General George Washington on 27 July 1777. After his appointment Erskine drew more than 275 maps covering the northern sector of the Revolutionary War. 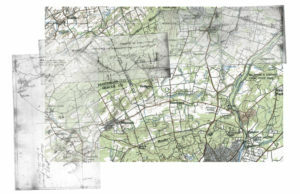 The map was digitally scanned from “New Jersey’s Sourland Mountain” by T.J. Luce, digitally separated into its three sections, ghosted (to look through it) and overlaid onto a modern digital topographic map. The resolution of the Erskine map scan is finer than the underlying modern map, therefore, the viewer needs to digitally zoom in and navigate to see detail of the route that Erskine surveyed. The Route begins near Blackwells Mill (Hillsborough Township) and ends north of Pennington (Pennytown). It enters present day Montgomery Township on Township Line Road and Willow Road, passes through Belle Mead, South on Present day Rte 601, then turns up present day Dutchtown-Zion Rd. threading it’s way across the Sourland Ridge. Interesting things about this overlay are that is matches present-day roads almost exactly. One can see that intersections mostly, are different (to accommodate modern traffic needs). Names and features that existed in 1779 can be matched to present day locations by following the route. Looking at it another way, the roads / route Erskine drew on this map through Montgomery Township are almost exactly as they were in 1779.